It is that time of the year when the breath of the crisp sandy cool sea breeze in the mornings confirms that our mild, desert winter is here. With it, it brings a gush of festivities, weddings, parties and many visitors – the return of old friends and family living abroad, to enjoy winter Karachi-style. I suppose it’s because the best weather comes around this time of the year and people choose winter holidays over the summer ones to plan their events and trips. Suddenly, Karachi comes alive during the morning, afternoon and evening, as opposed to just the evening like in the sweltering days of summer. There is a lot of excitement in every house hold as people prepare for a flurry of guests dropping in unannounced every other day. I always remember my mother having something ready to serve the guests at a drop of a hat and my grandmother would be able to produce an array of treats within seconds. In Pakistan, you feed your guests before you eat yourself, you never have less than three things on your tea trolley and you never let anyone leave your house without a cup of tea and a samosa. It’s just sacrilegious to do otherwise. Money, status and position in life don’t change this tradition but what might change is what we serve to our guests. Either way, this tradition is enshrined in our way of life and, hence, I don’t remember ever leaving anyone’s house not stuffed! The one kind of samosas that always reminds me of my maternal grandmother (Nanny Mummy) are sweet banana parcels – tiny, crisp samosa leaves that wrap a sweet fragrant banana mixture with coconut and dusted with icing sugar. I don’t remember much else about them but what I do remember is how it felt to bite into one. The audible crunch of the pastry followed by an instant hot, sweet, aromatic burst of honey-like Pakistani banana. This reminded me of the combined pleasures of eating banana fritters and the satisfaction of devouring a McDonald’s hot apple pie and trying not to burn my tongue! One was never enough, dipped in freshly whipped buffalo milk cream, the combination was reckless but divine. So here I have created a memory of sipping warm cardamom doodh pati chai and munching a hot banana samosa – the combination is so good that it takes me back to Karachi, to sitting with my Nanny Mummy on her soft, fluffy bed, watching her favourite show Tanhaiyan and chatting about her petunias. 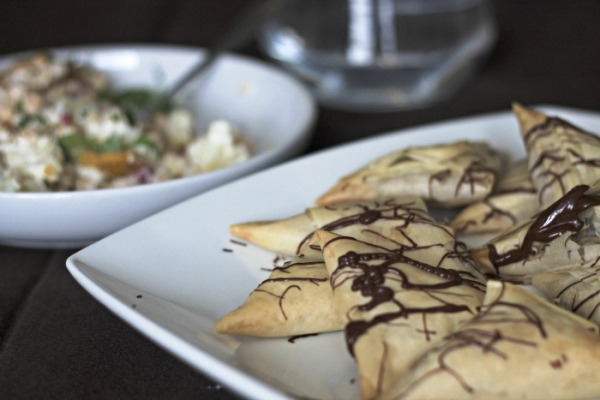 This recipe makes about 10 samosas and can be either baked or lightly fried in vegetable oil. I usually bake them for the sake of unwanted additional calories and cholesterol. Preparation and cooking time is about 20 minutes. 1. To make the samosa filling, combine the mashed bananas with the coconut, ground cardamom, jaggery or sugar and cover it. 2. Pre-heat your oven to 200° C. Place two filo pastry sheets on top of each other and place one heaped teaspoon of the banana mixture at one corner of the sheets and fold it into a triangle, fully covering the banana mixture. Oil the filo surface as you keep folding it, until you reach the end of the pastry. Stick the loose corners together with a little oil. 3. Make all the triangles and then place on a baking sheet, brush them with oil and bake them in the oven for about three to four minutes or until they turn light brown. 4. To make the chai chocolate drizzle, place the chocolate in a glass bowl over a pan of boiling water on the stove, making sure that the water does not touch the glass bowl, and melt the chocolate. Add the salted butter and stir until everything is evenly melted and mixed well together. Then stir in the crushed tea leaves. 5. 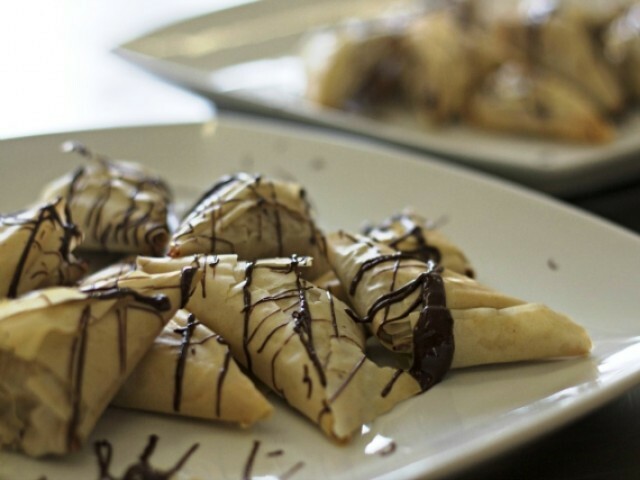 To serve, dust icing sugar on the samosas and lightly drizzle the chai chocolate drizzle on top of them. Once it’s ready, you can have these with a fresh, hot cup of tea and enjoy them with your guests on a cosy winter day! 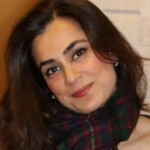 She is a writer and cookery teacher based in London, UK, specialising in the cuisine of Pakistan, where she was born and raised. She blogs at www.mytamarindkitchen.com/ and tweets as @MyTamarindKtchn (twitter.com/MyTamarindKtchn) She is also the author of a cookbook, Summers under the Tamarind Tree.